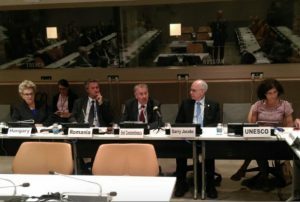 At the UN headquarters in New York on September 14, the conference entitled “Inauguration of the Parliamentary Multi Track Initiative Council for the SDG’s and the Culture of Peace” was organized by the Inter-Parliamentary Coalition for Global Ethics. Emil Constantinescu [former President of Romania] was the chairman of the conference and gave the opening speech entitled “Global Peace Initiative from the Levant, the foundation for a new culture of peace,” his press office announced in a statement. The presidium of the conference included Ambassador Ion Jinga, Permanent Representative of Romania to the United Nations, Ambassador Katalin Bogyay, Permanent Representative of Hungary to the United Nations, Lily Valchanova Liaison Officer UNESCO, Garry Jacobs, president of the World Academy of Art and Science and the World University Consortium, and S. Bekerman, secretary general of the Interparliamentary Coalition for Global Ethics. Participants in Sessions 1 and 2, led by President Constantinescu included Giandomenico Picco, former Under-Secretary General of the United Nations and adviser to the Oxford Research Group, Master Jun Hong Lu, president and director of the Oriental Media Buddhist Association, Rabbi Elie Abadie, Director of the Jacob E. Safra Institute of Sephardic Studies at Yeshiva University, Imam Agha Jafri, founder of the American Muslim Congress, Wafik Moustafa, president of the Conservative Arab Network, Dr. Lahoucine Khabid, president of the Atlas Center for Diplomatic Studies, ZH Khurram, secretary general of the International Youth Forum, Dr. Boris Pincus, President of Religions in Dialogue, and Rabbi Yaakov D. Cohen, founder of the Institute for Noahide Code. . .
At its annual conference in 2011 in Berlin, the Academy for Cultural Diplomacy launched a project for a new type of relations between nations and states based on understanding instead of military pressure or economic conditions. . . It seems that this kind of relationship that gives peace a chance in the globalized world can find inspiration in the ancient world of the Levant. This is not only because the Levant was the cradle of cultural diplomacy, but also because many civilizations including the Egyptian, Jewish, Assyrian, Babylonian, Phoenician, Greek, Arabic empires Roman, Byzantine and Ottoman empires were created in the Levant where they expanded exchanges of goods and ideas. South-East Europe has long been in contact with North Africa and the Middle East, and the people who live here have a long and extensive experience in intercultural dialogue. In 2012, the Inter-Parliamentary Coalition for Global Ethics took up the initiative and expanded it globally. In 2013, at the end of the conference organized in Bucharest with a wide range of religious, academic and parliamentary representatives, a joint project was set up for the initiative. Considering that the Global Peace Initiative from the Levant could serve as a benchmark and model to achieve peace in all areas of conflict around the globe, on 24 and 25 June 2013, the Inter-Parliamentary Coalition for Global Ethics organized a conference at United Nations headquarters in New York dedicated to promoting this initiative. The Romanian Parliament endorsed it with a message of support. Religion: a barrier or a way to peace?, What makes it one or the other? 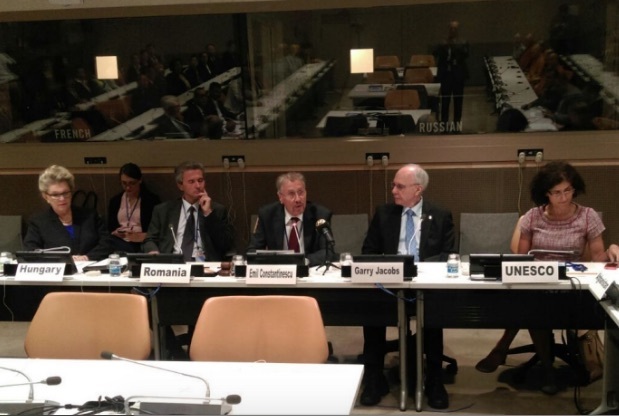 In March 2014, the Inter-Parliamentary Coalition for Global Ethics organized a new conference in New York together with the Foundation for the Culture of Peace, headed by Federico Mayor. It is planned to present the Global Peace Initiative from the Levant to the Congress of the United States, the British Parliament, the Knesset of Israel and to many other parliaments, including those of Japan and Palestine. . . . This project, dedicated to promoting a culture of peace, invites the participation of researchers and scholars in the humanities, theologians, writers, artists, architects, musicians to build a space of knowledge and understanding through co-operation and mutual respect. A culture of peace is based on a new type of relations, not only between states, but especially between peoples who share common values that were born long before the current nation-states. The time has come for cultural diplomacy and recognition of the old legacy of the Levant, an alternative reading of the history of this region, especially prior to the wars and conflicts of the present millennium. It offers a new approach, emphasizing what we have in common and what can unite us: principles, values ​​and skills practiced in the past, that can now be harnessed to ensure not only the stability of this region as a whole, but also building a model of cooperation and trust for all countries. It does not mean that we should deny our past, but to assume it in its tragic dimension. . .
For quite some time international organizations such as UN, UNESCO and civil society have been trying to create a political culture of security through negotiation and cooperation. To promote peace and understanding in the world they have been looking for the lowest common denominator around which we can agree. It is a welcome step and especially in the face of the many immediate threats. My belief is that we should propose much more. If we want to achieve true peace and understanding between people we should not focus on the lowest common denominator, but to refer to the highest common denominator – faith. Modern and postmodern societies of the 20th century have promoted equal rights and freedoms regardless of racial and ethnic differences and equal opportunities for women. But all this tends to divide society rather than unifying it. A peace based on a common ideal would be ideal, although it is a difficult task, not a peace imposed under the pressure of fear, but a peace springing from the depths of consciousness of millions of people. The treasure of the philosophical, literary, artistic millenary history of the Levant can help inspire a spiritual revolution with a profound knowledge of the human being who has been torn for millennia in the struggle between the aspiration to love one’s neighbor and the tendency to use power to oppress them or to oppress others in their own interest. We can turn this vast pedagogy of suffering into a pedagogy of reconciliation. Twenty years ago, millions of people in Eastern Europe with empty hands, were ready to fight and die for freedom and democracy against the greatest war machine in history. In a new millennium, we can rediscover faith. Not to use it one against another, as has been done throughout the long history of mankind, but to understand our purpose on Earth. Peace is the name of God, whether we are Christian, Muslim, Jewish or faiithful to Asian religions. Only human arrogance has made us forget the Lord’s message, whatever name we give it to him in the language or our faith. If the Levant, the cradle of the great monotheistic religions, will carry out a political and visionary project adapted the great challenges of today, it will contribute not only to a new identity of the area, but also hdlp to create a different concept of the future world called into a new humanism.”.